View More In Cocktail Picks - Page 2. 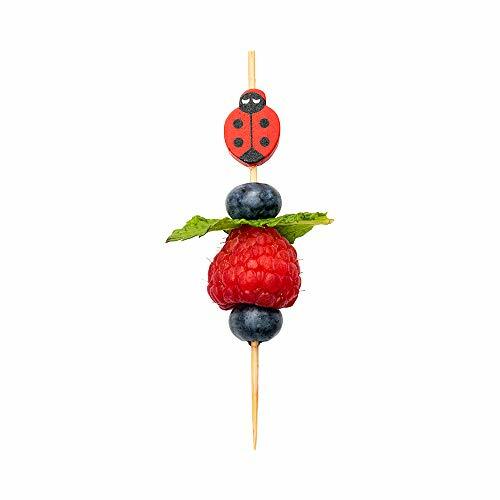 Top off bite-sized appetizers and miniature desserts with these extra lucky Ladybug Bamboo Skewers! Featuring an attention-grabbing red and black ladybug accent, these decorative picks are an excellent addition to baby showers, cocktail parties, buffets, and other catered events. The large wooden ladybug bead acts as a convenient stopper to prevent your ingredients from sliding off -- while also providing guests with an easy-to-grip way to pick up and enjoy your treats. Use them as appetizer picks to serve miniature veggie skewers and chocolate-covered berries, or use them as cocktail picks to create playful garnishes for handcrafted cocktails and freshly squeezed lemonades. These 4-inch bamboo picks are crafted from eco-friendly and renewable bamboo. Sold in a 1000 count box. UNIQUE, STYLISH ACCENTS: These bamboo picks feature a black and red wooden ladybug accent to grab your customer's attention and effortlessly enhance your presentation. Adds an extra special touch! SUSTAINABLE AND ENVIRONMENTALLY FRIENDLY: These skewers are made from premium bamboo, a fast-growing renewable and sustainable resource. SHARP FOR EASY PIERCING: Quickly spear olives, cherries, lemon wheels, lime wedges, and other cocktail garnishes! Easily stab and assemble bite-sized hors d'oeuvres, appetizers, and desserts! MADE FROM BAMBOO: Incredibly strong and naturally durable, bamboo is the ideal material for making stylish and reliable skewers. SOLD IN BULK: Sold in 1000 count boxes at the same affordable wholesale pricing that we offer to our restaurant and catering clients.